This blog posting was prepared by one of our volunteers, Frank Lockley. 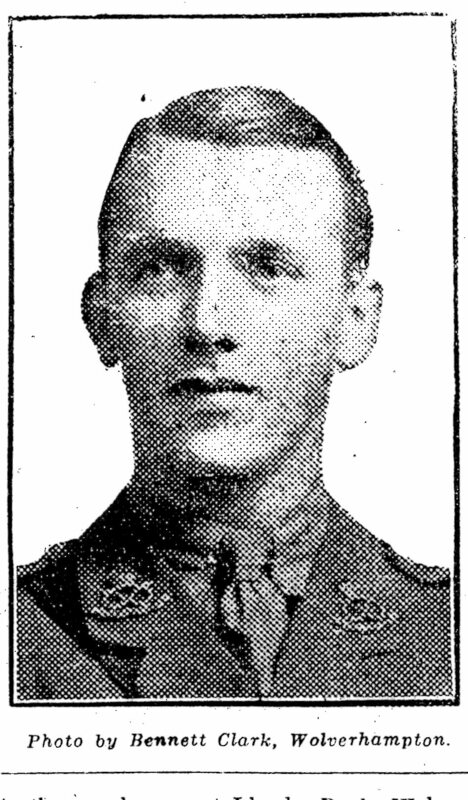 The Express & Star of 4th May 1918 reported the death of Second Lieutenant W. R. Barnett, killed in action. William Raymond Barnett was born in 1892, the youngest of four children to Henry and Harriet. In 1911 the family is living at 19 Copthorne Road, Wolverhampton and William is a bank clerk at Lloyds Bank. He joined the South Staffs regiment early in the war as a private, regimental number 3034. He first entered France in March 1915 and was commissioned as an officer in May 1917. At the time of his death he was in the 8th battalion, attached to the 1/5th battalion, that in April 1918 was stationed in north east France. William is buried at the Commonwealth War Grave Commission’s Beuvry Communal Cemetery Extension alongside the others that died in the action. Very early on in the War, there were obvious concerns about food shortages that might result from the disruption. 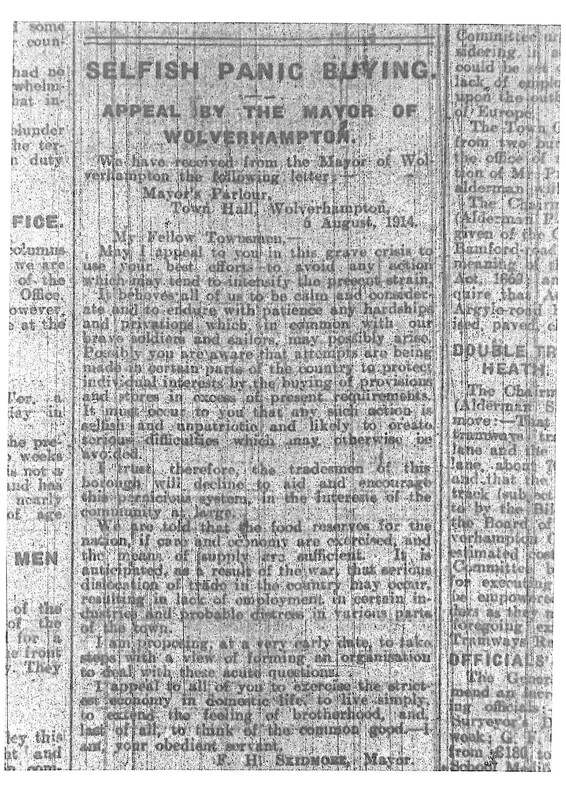 On 6 August 1914, the Express & Star published a letter from the Mayor of Wolverhampton, Frederick Howard Skidmore. This was an appeal for all local residents to “be calm and considerate”. He referred to the “hardships and privations” that the soldiers and sailors would be undergoing overseas, and urged Wulfrians “to exercise the strictest economy in domestic life.” There were apparently already reports of “buying of provisions and stores in excess of present requirements” in other parts of the country. Skidmore denounced these as “selfish and unpatriotic”. The Mayor also appealed to local trades people to ensure that they did not encourage such behaviour, “in the interests of the community at large.” He proposed the formation of an organisation in order to deal with this matter, and to ensure that the food reserves would be sufficient, if everybody thought of “the common good”. As rationing was not introduced until 1917, it is clear that these measures enjoyed some level of success. This blog post was prepared by volunteer, Frank Lockley. 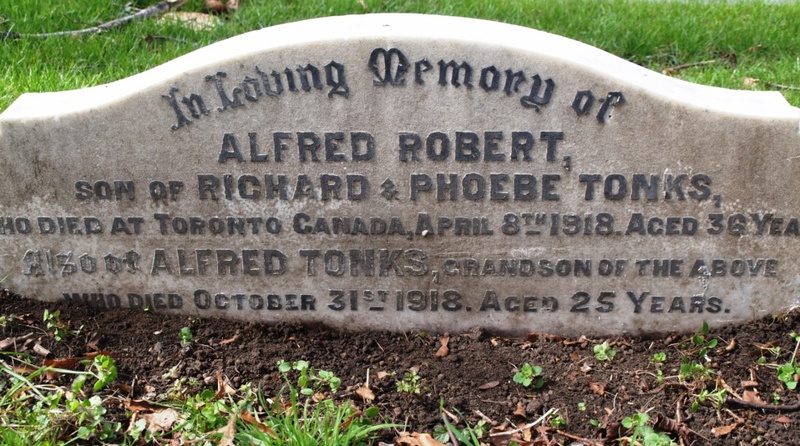 Alfred Tonks was born in Barnsley in 1894. In the 1901 census he is shown as living in Cannock Road Wolverhampton with his grandmother Phoebe and family. In 1911 he is living at 20 Frederick Road, and working as an apprentice plumber. He joined the 6th Territorial Battalion South Staffordshire Regiment in 1911, and his service records show that he attended training camps of 2 weeks each in 1911, 1912 and 1913. Alfred married Elsie Ricketts on 3 June 1918 at Holy Trinity. They had a son, Arthur, in October of that year but Alfred died on 31st October 1918 and was buried on 4 November in a family grave, together with his son Arthur aged just 16 days. Their address is given as Graisley Lane, Wednesfield. It is possible that both Alfred and Arthur were victims of the flu epidemic. The following week, the Express & Star reported that there had been 40 deaths from flu in the town that week, a figure that indicated the epidemic was on the point of subsiding and had reached its peak. However, Elsie’s son from her second marriage, Ken, believed that Alfred was shot in the head by a stray bullet while he was peeling potatoes. The suggestion is that it may have been “friendly fire”, but we cannot be certain of this. This unassuming little item turns out to have quite a lot of significance. 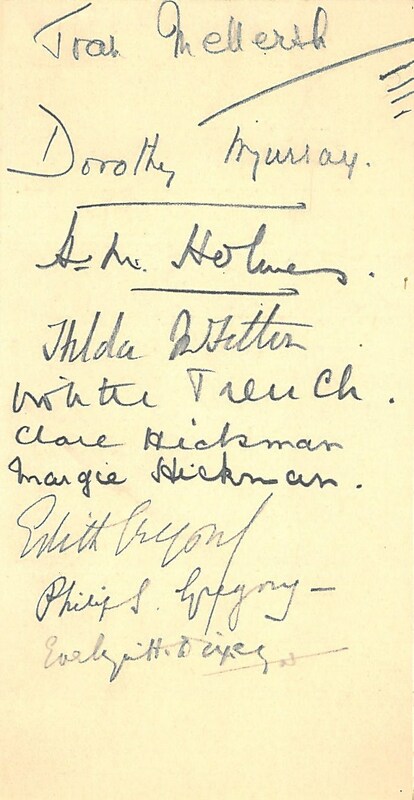 It is contained in a collection of family papers belonging to a Miss May Hickman, who was the sixth daughter of Sir Alfred Hickman. She married into the Fitton family of Fairlea, in Malvern (Worcestershire) in 1910. Her husband was Brigadier-General Hugh G Fitton, the aide-de-camp to George V. Hugh Fitton was later killed in action in France during the Great War, in 1916. 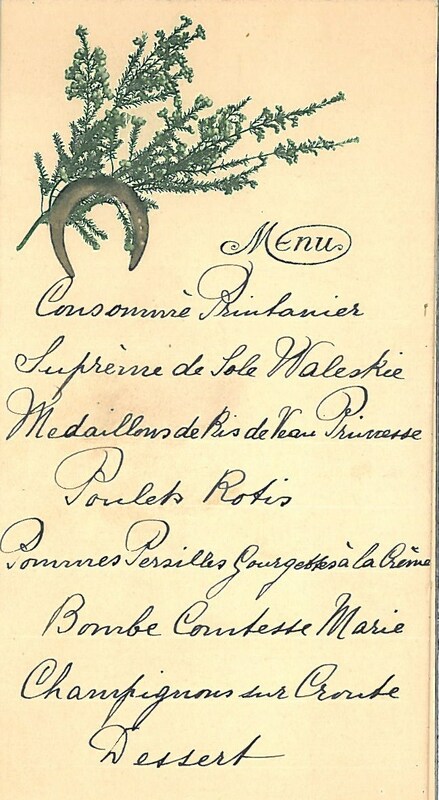 This menu is signed by the attendees of the dinner party, and dated 28 July 1914. This is the date when Austria declared war on Serbia, marking the start of the First World War (Britain declared war a few days later on 4 August). Perhaps the attendees at the dinner realised the significance of this date, which is why they signed and dated it? It is certainly why this menu was kept and survives to this day, exactly 100 years later. Philip S. (Spencer) Gregory – married Edith Annie James in Kensington in September 1876. The back of the menu is signed by Isabel Fitton, presumably the host of this event, and this brings with it an added significance to this little item. 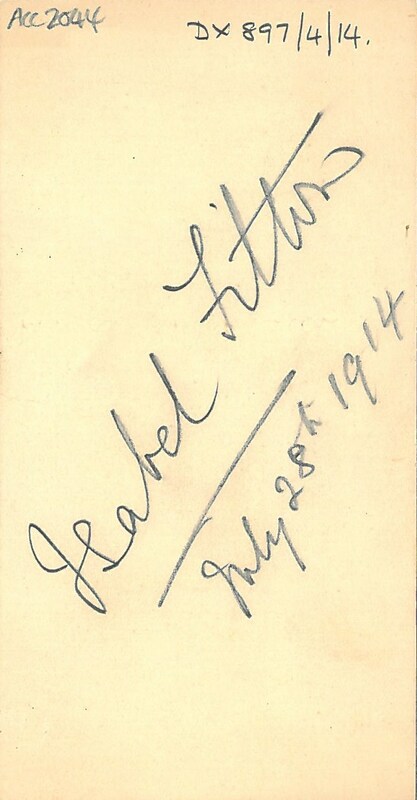 Isabel Jane Fitton, born 1868 in Warwick, was also the sister of Hugh Fitton. She lived at Fair Lea, Graham Road, Malvern, and was a viola pupil under Edward Elgar. In fact, Elgar named his Variation VI in his “Enigma Variations”, “Ysobel”, after Isabel Fitton, following an exercise he devised for her for crossing strings. Given that Elgar was apparently a Wolverhampton Wanderers fan and used to cycle up from Malvern to watch the team play, this is a lovely connection to have in our Archives. 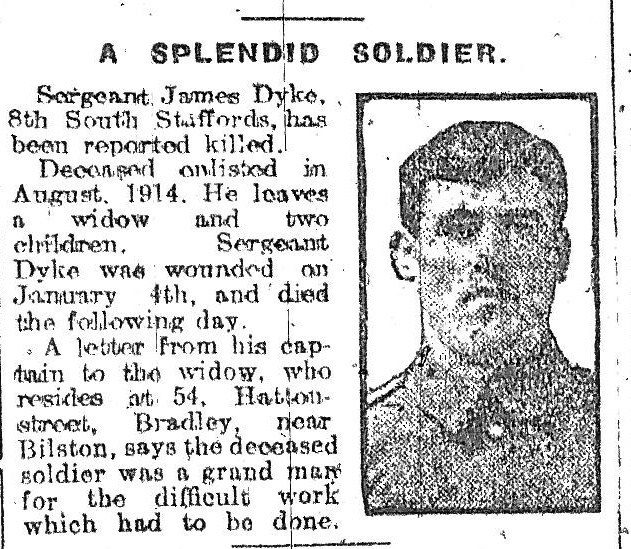 James Dyke, a Sergeant with the 8th South Staffordshire Regiment (service number 12139), was reported killed in the Express & Star on 14 February 1916. He had enlisted in August 1914 and had been wounded on 4 January 1916 and died the following day. He apparently left a widow and two children, who lived at 54 Hatton Street, Bradley, near Bilston. His entry on the Commonwealth War Graves Commission gives his date of death as the 4 January, stating that he was 25 when he died and was the husband of Mrs. Dyke, of 11, Ash St., Daisy Bank, Bradley, near Bilston, Staffs. There is a James Dyke born in Wolverhampton in 1890, and another born in Dudley in 1891, so either of these could be possible. Without a first name for his wife, I have only been able to narrow it down to two possible marriages, in 1909 and in 1911, but I have not been able to find any record of children from these marriages. I have also found a possible James Dyke living with his parents James and Louisa in Dudley in both the 1891 and 1901 censuses, given as having been born around the right period in Bilston. There is a J. Dyke listed on Dudley Town Memorial, so it is possible that he was originally from Bilston, moved with his family to Dudley and then to Bradley with his wife. However, I cannot find him on the 1911 census, when he would possibly be with his wife, so I have hit a bit of a brick wall. Any further suggestions would be gratefully received! He is commemorated at Lijssenthoek Military Cemetery in Belgium, and on the war memorial outside Christ Church, Coseley. 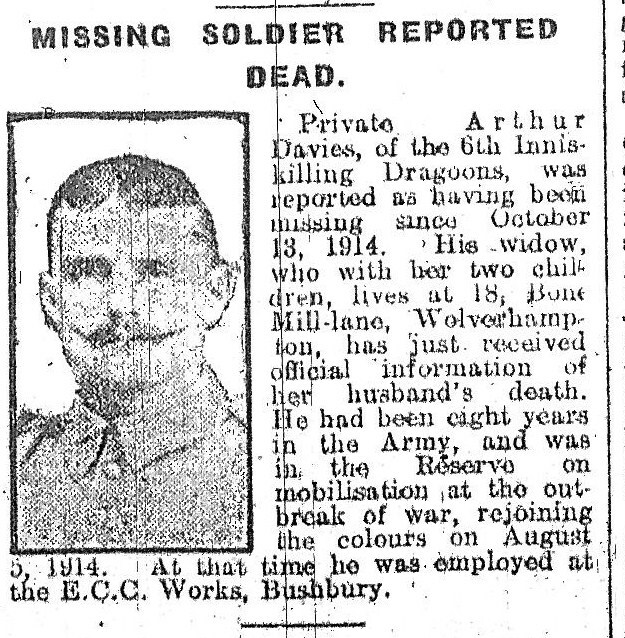 Private Arthur Davies was a member of the 6th Royal Dragoons (Inniskilling) (Service number 4946). He was reported missing on October 1914, and it was not until 14 February 1916 that it was reported in the Express & Star that his widow had received official notice of his death. According to the article, they lived at 18 Bone Mill Lane, Wolverhampton. Davies had served 8 years in the Army, and had rejoined the colours on 5 August 1914. He had been employed at the Electric Construction Company in Bushbury. He appears on the Commonwealth War Graves Commission site, confirming that he died on 30 October 1914, and is commemorated on the memorial at Ypres. Given his common name it is quite difficult to pin Arthur Davies down, as there are various options for his birth, marriage and census entries. If anyone has any further information, please get in touch! In common with the other local councils, the minutes of Tettenhall Urban District Council include very few references to the War. This blog posting will focus on the first minute book for the period, covering July 1914 until January 1915 (reference: D-TET/1/9). During this period, the Council meetings were chaired by Samuel Bayliss. The majority of Council business during this period appears to centre around planning, sewerage and public health issues. However, two other War-related matters are discussed. On 14 August 1914, the Council (again in common with Wolverhampton Council), agrees to the appointment of Special Constables in the Tettenhall Police Force to fill the vacancies left by Police Officers who have enlisted, asking for a notice to be “posted on the Council Notice Board & the Surveyor was requested to keep a Register of names of applicants.” Unfortunately, this Register does not appear amongst the records we hold for Tettenhall Urban District Council, so we can only assume it has not survived. On 9 October 1914, a letter was read out from a Mr Davis Green, regarding the application for relief from rates for Belgian refugees. However, the Council states that it is awaiting “some definite instructions from the Local Government Board.” As this issue does not resurface throughout the rest of the minute book, clearly it was not dealt with at this period. This blog posting has been contributed by one of our volunteers, Lisa Gibbons. Following the end of the First World War Bilston Town Council formed a War Memorial Committee. They raised funds to erect three memorials, one each in Bilston, Bradley and Ettingshall and to purchase a suitable property and grounds to provide comradely solace to ex-servicemen. The intention was to set in stone the names of the Fallen Heroes, who had joined up and made the ultimate sacrifice for their country. The Laburnums, a large house in Bilston, was purchased and converted, with billiards room and grounds in which old soldiers could spend time with their comrades who understood the horrors that had been seen but, for the most part, were discussed with wives and families. The names were collected by a variety of methods, local churches and chapels sent in members of their congregations who were being mourned, St Leonard’s Church published names of fallen soldiers in the parish magazine. Street surveys were made, knocking on doors and collecting the names from each ward (High Town, Town Hall, New Town, Bradley and Ettingshall). This exercise demonstrated heartbreakingly how many families had lost more than one son, The War memorial Committee also took out advertising in the local paper. Lists of these names were collated and these formed the content of the Record and programme of the Unveiling of the War Crosses on Friday 11th November 1921. The programme cost three pence. Following the dedication of the memorials the names and details of several Bilston men who had not been included, for various reasons, were forwarded to the Town Hall. They were presented on scraps of paper, the backs of old invoices and in letter form. 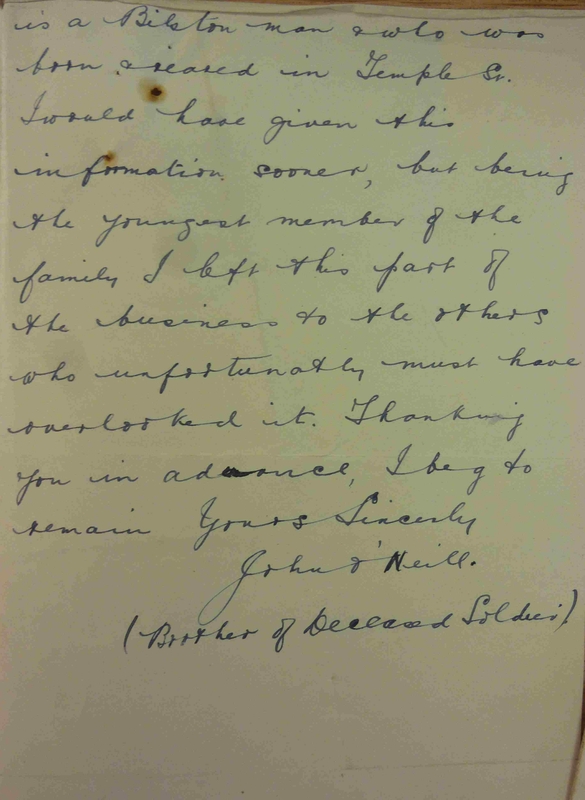 Among the papers held in Wolverhampton Archives is a letter dated 21st November 1921, just ten days after the dedication services. It was written by John O’Neill, who lived at 22 Cambridge Street, but who in 1911 was living in James Street, Bilston with his wife Daisy Maud Williams and young sons John and Leslie. In 1911 he was Bilston’s Town Postman, I wonder if he delivered the letters from the Front and maybe the telegrams that no one wanted to receive? I should be glad if you would include in your list the name of 5527 Pte. Michael O’Neill, 2nd Battn. South Staffs Regt., who was killed in action at Givenchy, France on May 17th 1915 & who is a Bilston man & who was born and raised in Temple Street. John explains that he was the youngest in the family and had left this “part of the business to the others who unfortunately must have overlooked it”. Michael was born in Bilston to Thomas and Bridget O’Neill. Bridget had been married before and was widowed. In 1871 Thomas had married Bridget and the girls were noted as his step daughters, Mary, Honor and Bridget Coyne. They lived at the time in Oxford Street. Michael was the second son born to the couple, he was baptised at Holy Trinity Church on 18th August 1878, (the records show the name O’Neal). By 1881 our Michael was two years old, with older brother Thomas being nine. Their father was a labourer at a coal mine and he would follow the coal mining occupation until 1901. The family lived at 6, 6ct Temple Street, they had moved to 1 keys Yard in 1891 and the family had been joined by Ellen and young John. In 1901 Michael was not living with his parents only the two younger children were still living in Temple Street. Michael had moved out of his parent’s home but in 1911 was lodging with Widow Dabbs and her family at 15 Pipes Meadow. 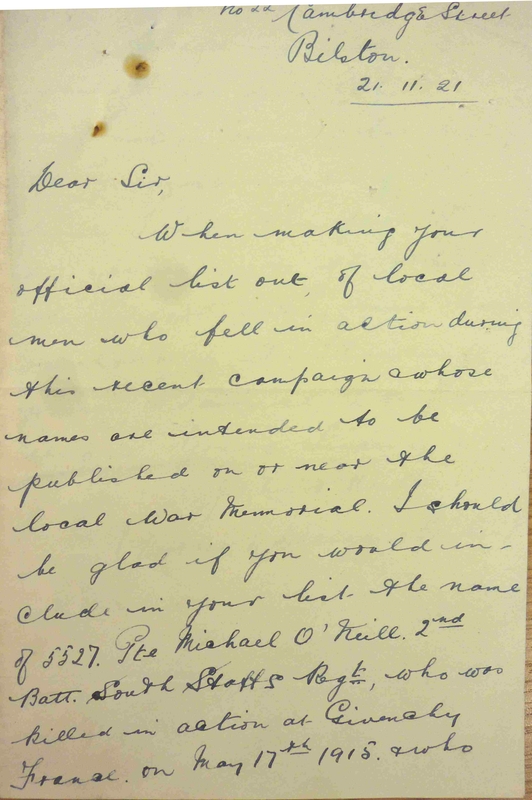 Michael O’Neill’s service records are not available; there is a record of his death which states he died on the 18th May 1915 as opposed to his brother’s recollection of the 17th May 1915. He is commemorated at Bethune Town Cemetery (here his name appears as “M. O’Neil”), but I can find no record of his name being included on his home town’s memorial. Every possible effort has been made to get a correct list of the fallen prepared. Anyone who sees that a name has, after, not been supplied or any other particulars are lacking, should at once communicate with the Hon. Secretary, Mr. Joseph L Arlidge, at the Town Hall, Bilston, who will see that enquiries are made and the names are properly recorded in due course. Because of the naval blockade in 1917, rationing of sugar, and later meat, butter, cheese and margarine was introduced in 1918. 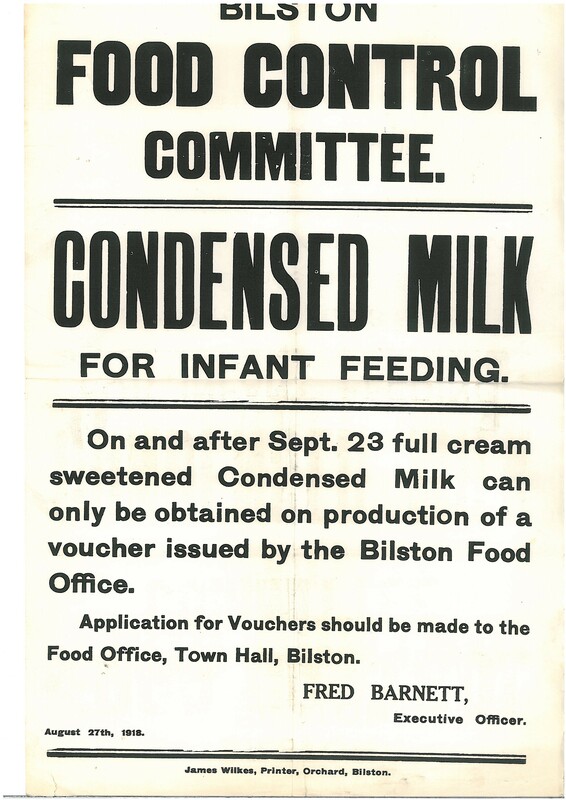 At Wolverhampton Archives we have a file of material around the Bilston Rationing Scheme, including application forms and posters. 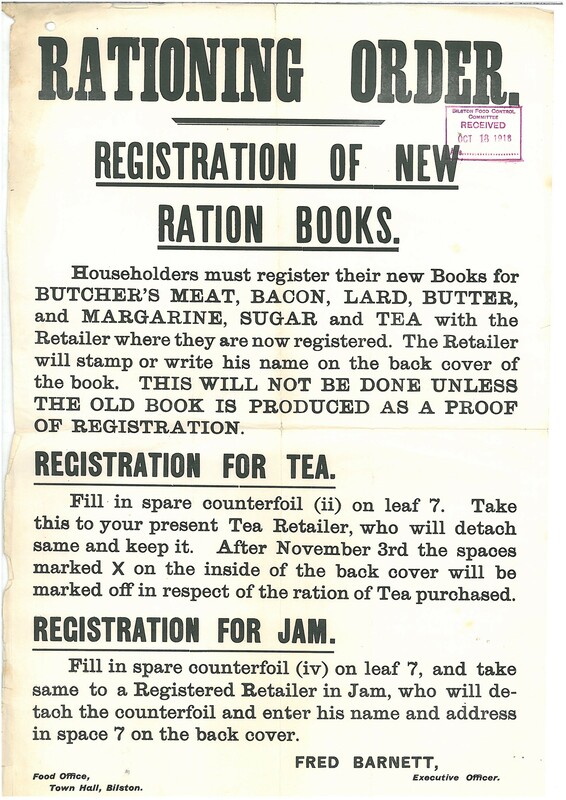 The Bilston Food Office issued a circular to shopkeepers on 4 February 1918, granting them a Certificate of Registration under the Bilston Scheme for Rationing Tea, Butter & Margarine, and giving them instructions about what they could accept. Suppliers could accept customer cards from the whole Wolverhamption area rationing scheme, including Wolverhampton, Heath Town, Tettenhall, Wednesfield, Sedgley, Seisdon and Coseley, as long as the customers had been “regular customers up to the present”. Other material includes a circular, dated 14 March 1918, stating the “heavy workers” are entitled to supplementary meat, as long as they fill out the relevant form. A month later, supplementary rations were available for boys aged 13 to 18, as long as they were not already possessing supplementary rations for heavy workers. Householders were also encouraged to “make their own bread and bake it at their homes where possible”, as “the Master Bakers in the Town are endeavouring to Bake as much Bread as possible.” Tea, Butter and Margarine could only be sold from Wednesday until Saturday, as they could not be supplied on the other days. 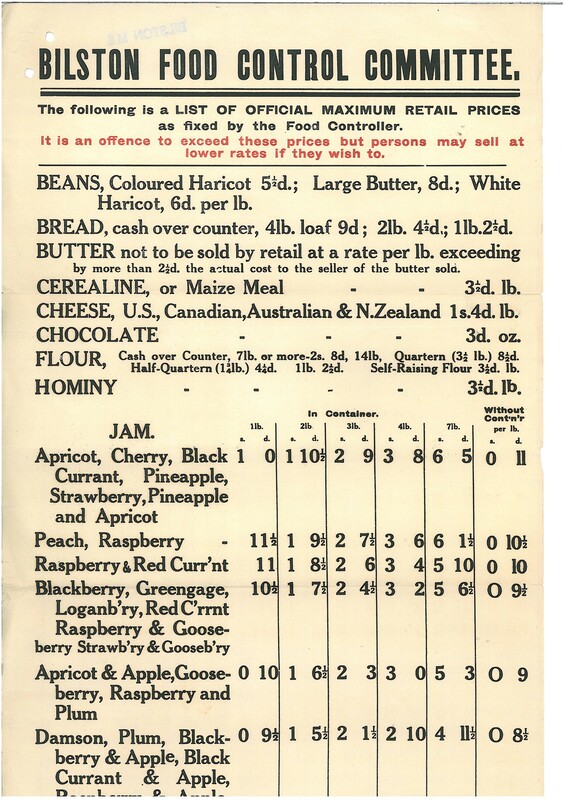 In weeks where the shortages were greater, shopkeepers were instructed to divide their supplies equally between their registered customers, even when they were unable to give the full ration. Harold Edwards was the son of Silas and Jane Edwards (nee Southan), and was born on 12 September 1895. By the 1901 census Harold was living with his parents at 19 Wolverhampton Street, Bilston, together with his brothers Enoch, James, George and Charles, and sister Florence. By the 1911 census the household had moved to 24 Dudley Street, Bilston, and Harold, now a labourer, was the only child still living with his parents. The household were joined by boarder, Stephen Walker. For conspicuous gallantry and devotion to duty on the 26th September 1915, near Hlluch, Private Edwards, acting as stretcher bearer, while dressing a wounded man under heavy fire during the attack on the German trenches, was severely wounded, and although several men offered to help him in his work, he refused to allow this, or to be attended himself. Having finished his work, he walked over, in full view of the enemy and attended another wounded man, when he was struck by another bullet, and fell wounded a second time. He gave a fine exhibition of the highest courage and disregard of personal danger. Harold is mentioned in the minutes of the General Purposes Committee of Bilston Urban District Council, on 17 May 1917. The Committee decided to arrange for a public presentation of the Distinguished Conduct Medal to Edwards at Hickman Park, Bilston, on 27 May 1917. At a meeting of the full Council on 24 May, this date was amended to 10 June, as the 4th Volunteer Battalion of the South Staffordshire Regiment were due to be present that day on a route march. After the war, Harold married, and the couple went on to have two children, Harold and Gwen. Harold died in 1970.